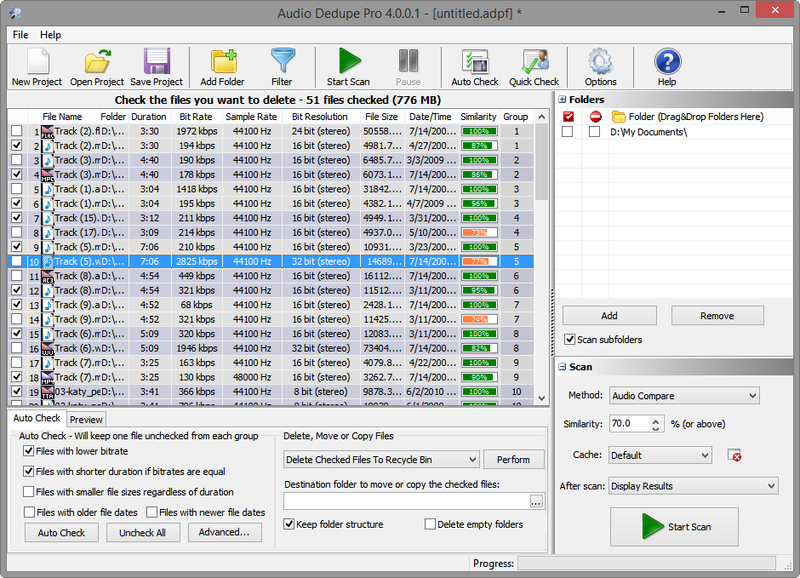 Audio Dedupe is the fastest and the most precise tool for finding similar and duplicate songs and can recognize similar audio regardless of the file format. It “Listens” to the audio files in order to find similarities. The tool is able to identify exact duplicates or remixes of the same song stored in various audio file formats. Support for most of the popular audio formats is present and it is easy to organize songs in iTunes, iPod, iPad, iPhone or other mp3 player devices. Here are some of the supported file formats: Supports MP3, MP2, MP1, MPA, WAV, OGG, AIFF, AAC, MP4, FLAC, AC3, WavPack (WV), Musepack (MPC) and Windows Media Audio (WMA) file formats. This release does not add much features and is mostly oriented towards STABILITY and PERFORMANCE. Not all improvements are listed above, but these are just a few of the new features and fixes in this release. The log file now provides extra details about damaged audio files that may be present in your audio collection. If you have issues with freezing you can enable logging in settings and after the scan check the log file content which is located in “My Documents” folder and named “AudioDedupe_Log.txt”. Even if you do not have any issues with the Audio Dedupe application it is a good idea to run a scan with the log file enabled in order to identify damaged files and clean your audio collection by removing or repairing them. It is recommended to disable this feature if not needed as it will degrade the performance a bit. This entry was posted in Audio Dedupe and tagged Audio Book Software, Audio Easy Mp3 Workshop, Audio Moderal Jukebox, Audio Mp3 Music Explorer, Audio Mp3 Tag Clinic, Best Audio Organizer, Best Way To Organize Music, Fix Damaged Video Files, How To Fix A Damaged Pdf File Online, How To Fix Damaged Files On Mac, How To Fix Damaged Files On Xbox 360, How To Fix Damaged Pdf Files, How To Fix Damaged Pdf Files Free, How To Fix Damaged Photo Files, How To Fix Damaged Rar Files, Mediamonkey, Musicbrainz, Organize Audio Files, Organize Music, Organize Music Files, Organize Music Library, Organize Music On Android, Organize Music Software, Organize Songs An Ipod Shuffle, organize songs by bpm, organize songs in itunes, Organize Songs In Spotify, organize songs on iphone, Organize Songs On Ipod, organize songs on ipod touch, Organizer Mp3, Program To Organize Music on December 12, 2014 by MindGems Support.